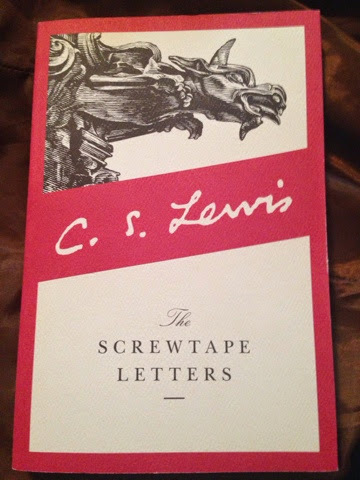 This week's book is The Screwtape Letters by C.S. Lewis. Characters who love this book: Stan from Ghostly Mostly (#1 - Chicago Scream) and Robert from the Undead Bar Association (#3 - Binding Deceit). Robert: Do I start? Okay. The Screwtape Letters is a book of conversations between two demons. Stan: Yes. Two demons talk about how to claim a human's soul for hell. Robert: The best thing about the book, the reason it resonates, is the way it's written. The author, C.S. Lewis, starts with a preface in which he sets the scene. He makes it seem like the letters in the book are real, and he somehow got his hands on them but won't reveal how. Stan: (smiling) How do you know they're not real? Stan: I'm kind of joking but not really. I think if demons are real, they are having conversations like the ones in this book. Robert: And I say it's the author's choice of the epistolary writing style that makes it seem so real that you and I can easily believe in it. So Stan, what's your favorite part? Stan: Trying to figure out the lead demon, Screwtape. There's some stuff he says that I don't think even he believes. It's like he's getting orders from someone above him that he needs to pass on to his underling, and he knows if the underling knows the real truth then work won't get done, so he lies. Robert: Yeah, Screwtape is definitely manipulating Wormwood. Stan: So what's your favorite part? Robert: My favorite part of the Screwtape Letters is technically not part of the Screwtape Letters, but it is in this addition of the book. Look in the back, at the preface to "Screwtape Proposes a Toast". Stan: (picks up book and flips to the end). I've never read this part before. Guess I just assumed it was an afterward and skipped it. Robert: I think that for men like us who face the supernatural everyday, that part of the book is the most important. It's almost like a missive of hope. Lewis talks about the balance between good and evil. He even suggests that he disliked his own book for being unbalanced, but that he couldn't have balanced the letters of evil with letters of good because he wasn't equal to the task of writing pure light. Stan: (reading from book): Mere advice would be no good; every sentence would have to smell of Heaven. Robert: Exactly. Lewis, one of the greatest writers of the modern age, felt unequal to writing from the perspective of angels. The best he could do was write like a demon. Stan: How is that a message of hope for men like us? Robert: If your job with the ghost hunting squad is anything like what I do, you're in the muck and darkness a lot. I sometimes feel like I've forgotten what truth and goodness look like. Maybe I haven't forgotten it, maybe I'm really fighting for it, and it's just my limits as a human that make it so hard for me to talk about good things. Stan: (shakes his head) I see good everyday. I see it from every member of the Ghostly Mostly team. Sometimes I even see it from the ghosts. I'm surprised you don't feel the same way, after all, you're on a good team. You work with Maryanne. Robert: You want to know what it's like working with Maryanne? Here, give me that book. (Stan passes Robert the book). Robert: (reads) The strain produced a sort of spiritual cramp. The world into which I had to project myself was all dust, grit, thirst and itch. Robert: She doesn't see any good in herself anymore, I swear, and it's beginning to feel contagious. Stan: That's no good, especially since I hear you too are going to be put in serious danger together in Book 4. Robert: I can't handle her alone. I know she's supposed to be the heroine, but she's starting to behave like an anti-hero. Stan: So call for backup. Stan: Matt or Damian, I think. Robert: It'll have to be Matt. I can't ask anyone on the Ghostly Mostly team for help until the cross-over book, and we're volumes away from that. Robert: What. What's bugging you? Stan: I'm just surprised to hear all this about Maryanne. Damian's said some really nice things about her, from when they were in high school together, and I could have sworn he said The Screwtape Letters was one of her favorite books. (Stan looks around). What are the rules here, Robert? Robert: What do you mean? Stan: In this Book of the Week thing, where characters from different series can talk to each other, what are the limits? Like, can I talk to the Author? Robert: I don't know. You could try. Author: (steps out from behind the ficus in the corner) Uh, hi. I'm here. I was trying to pretend like I wasn't, but oh well. What's up? Stan: Who's right about Maryanne? Author: No one's wrong about her, because everyone's entitled to their own opinion. Robert: Well that's a load of crap. Stan: Yeah. Either Damian's right and Maryanne's just a step below the angels, or Robert's right and being around her is a horrible strain. Author: I'm not convinced Maryanne's ever been a mere step below the angels. Stan: So Damian's wrong about Maryanne. Author: No! He might exaggerate things, but he's not wrong, per se. Neither is Robert. You can't see Maryanne as being all good or all bad. Believe me, I tried. I wrote her to be perfect in the original blog stories, and the readers hated it. So, I made changes. I let Maryanne be human. Robert: That's what's going on? Humanity? Author: It's like Lewis says in the Screwtape Letters. Some people are called closer to the true and pure things when they're in the troughs of life, not the peaks. Some in particular go through longer and deeper troughs than others. So maybe someone used to be sweet and good, and now they're not, but that doesn't mean that person is bad. Maybe they're in a low point in life, a trough, and maybe there's a reason for it. Robert: You mean Maryanne's character is being tested? Author: I'm not saying that. I'm giving you hypotheticals. Stan: (laughs) Right, you're a lawyer too. I'd forgotten it but now we're living with 'hypotheticals'. Author: I will say one thing that's definite and real. Robert, after listening to you today I'm worried about the strain being put on your moral fiber by the atmosphere you're in and the company you keep. I'll tell you what. For book 4 of the Undead Bar Association, I'll send Matt Hawthorne with you. Author: Matt may be stronger and more capable than you think. He may be more capable than I think. We'll find out. Robert: Then why isn't she here? Author. I don't know, but I'll try to find out.